"I would be proud and enthusiastic to be associated with Rotary in any way." One of the world's outspoken philanthropists describes the rewards of charitable giving and reaffirms his abiding respect for Rotary its mission. 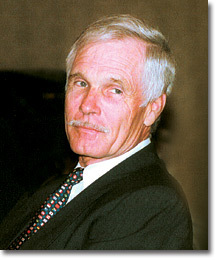 Departing one of his Ted's Montana Grills in Atlanta, renowned entrepreneur and former media mogul Ted Turner greets his interviewer from The Rotarian. "I love Rotary!" he proclaims. "Let's see, The Four-Way Test: Is it the truth? Is it fair to all concerned? Will it build goodwill and better friendships? Will it be beneficial to all concerned? " The son of a Rotarian and as a young man a member himself, Turner says he still believes in Rotarian standards and values. "I've never heard of anything that Rotary has ever done that wasn't well-intended and well-thought out to make a significant improvement in the human condition," he says.These days, improving life on the planet is Turner's main concern too. In 1994, he gave $200 million to charities. Since 1996, when his pioneer media flagship, Turner Broadcasting System, merged with Time-Warner Inc. (he stepped down as vice chairman in 2003), Turner has evolved from business mogul into visionary humanitarian, donating much of his time and half his personal fortune to organizations devoted to health issues, environmental and wildlife preservation, human rights, and problems associated with unchecked population growth. In 2000, as chairman of the nonprofit Turner Foundation, he and his family authorized $44 million for 574 grants to environmental and population control groups. Last year, the Turner Foundation, which he established in 1990, donated $49 million to organizations involved in a variety of issues, including nuclear arms control, prevention of teen pregnancy, protecting the endangered whooping crane, and environmental cleanups in Russia.Turner also has acquired nearly two million acres of prime U.S. ranchland, making him the largest individual landholder in the country. Since 1997, his private, nonprofit charity, the Endan-gered Species Fund, has overseen efforts to preserve indigenous plants, birds,fish, and mammals on this protected land and to restore entire tracts to their original biodiversity, including returning bison to tall-grass prairies, desert bighorn sheep to the New Mexico mountains, and wolves to the Rockies. In 1997, Turner also pledged an astounding $1 billion — at that time believed to be the largest single donation by a private individual in U.S. history — to create the United Nations Foundation and its sister organization, the Better World Fund, in order to "increase global awareness of the UN mandate to promote a more peaceful, prosperous, and just world." He also challenged others of means to follow his philanthropic lead. "I have always been interested in the totality of the planet," he says. "And there is no greater legacy that we can leave our children and grandchildren than a peaceful and safer world. "But Turner's overriding concern today, he says, remains "the issue of global survival," by which he principally means the threat of nuclear annihilation. In 2000, after consultations with security experts worldwide and a personal meeting with Russia's President Vladimir Putin in Moscow, Turner pledged $250 million to create the Nuclear Threat Initiative (NTI), a charitable fund aimed at reducing the threat posed by all weapons of mass destruction. Just two years later, NTI committed $5 million to a project to remove a cache of uranium — the equivalent of two and a half nuclear bombs — from a reactor in Belgrade, Serbia and Montenegro. And, he says, that's just the start. Recently, Turner created Ted Turner Documentaries, a nonprofit affiliate of the Turner Foundation that produces documentary films on security and survival issues, such as international terrorism. Its debut program, the eight-hour miniseries "Avoiding Armageddon," which aired on PBS last April, was the first post-11 September documentary to investigate the global threat of terrorism and weapons of mass destruction. The thrust of the film, Turner says, is that the world should not be surprised by recent warnings of possible terror-ist activities using nuclear weapons because nations have stockpiled such weapons openly for decades, with little international oversight. Thus, the film explores such issues as nuclear brinksmanship and the burgeoning black market in nuclear weapons and radioactive materials.Simply put, Ted Turner wants to save the world. He believes that while "intelligent philanthropy is hard work," it is an effective tool for mobilizing good people to do good things. He once said: "Humanitarianism gives a purpose to my life, and it makes me feel good to know that I'm at least trying to help out, that my money is a positive force in the world. "Today, he adds fervently: "Look, I'd like to see a world where we see the nobility in people. A world without land mines — with kids outside playing. I'd like to see us all acting like educated, civilized human beings." This interview with Editor in Chief Vince Aversano took place in October 2003. How did you first learn of Rotary? My father was a Rotarian for many years, and when I was a little shaver he took me to some of his club meetings [in Cincinnati, Ohio, USA]. Then, for two summers as a teenager, I worked for my father's sales manager, Russ Edwards, who was the former president of the local club in Charleston (South Carolina). I was his go-to guy — I carried his briefcase everywhere he went — and he took me to his Rotary meeting every week. When I went to Macon (Georgia), I joined the club there, and I was a member for a couple of years. But when I got to Atlanta, my Dad had died; and, besides, the [vocational] classification for "outdoor advertising" was already filled. That was the end of my direct involvement, but I did have a good 10 to 15 years of heavy exposure to Rotary. My father loved Rotary, and so did I. I've been asked to address a number of Rotary clubs during my business career, and I spoke at the  Rotary Inter-national Convention in Munich, Germany, before the Cold War ended. Do you recall your first Rotary meeting? I was just a little kid in Cincinnati, and I recall that I was not more than six or eight years old. I went on our father-son day. I mean, you're talking 60 years ago! But I remember how impressed I was because my dad talked about Rotary all the time, how great an organization it was. And he lived by Rotary's motto, too. Rotary has done a world of good. Membership is always an issue with our organization. Is there any advice you can offer Rotary that might help attract new members? One of the problems has to be that there are so many demands on people's time these days. Everything is just so speeded-up that reflection and introspection are suffering. And that is really bad, because we have an underinformed populace. I mean, things are so hectic and life's so stressful and things are changing so quickly. Rotary clubs have those weekly meetings with distinguished speakers coming in and putting things in perspective, and I think that's a calming and educational process that's very important. Was philanthropy a part of your vision back in 1963, when you assumed control of your father's billboard advertising business? My father didn't have a lot of money, but he was a generous person. I always contributed to the United Way and the Cancer Society, and even when I was in my early twenties, I believed that I should be giving back. If you don't have money, you can always give time, and I did that — I gave time. I had modest means, so I couldn't make large donations, but I made smaller donations that I could afford. I planned at an early age that if I hit the big time, I would be a big-time philanthropist. And I basically did that. Was it after you started Cable News Network that you were able to become, in your words, "a big-time philanthropist"? Yes. As we made progress financially, I started giving some substantial sums away. Then my business really took off, relatively overnight, and in just a few years I went from modest means to very wealthy, and so I raised my horizons. I started studying philanthropy, and I started the Turner Foundation, which is a family foundation that supports mainly environmental and population causes here in the United States and internationally. I got an international perspective because of my experience with Rotary, my sailboat racing, and CNN, which I decided to take international. You tried to bring more of an international perspective to CNN? Rotary, just like the United Nations, tries to create positive news in the world, which is good, because the U.S. news media primarily puts a negative spin on international affairs. I don't remember reading too many articles about Rotary's efforts, for instance, because as a newsman once told me: Good news ain't news. So I've tried to combat that with lots of international news at CNN. Balanced news. We don't wear American flags on our lapels. And what does an American flag waving constantly in the background of a newscast have to do with news, anyway? In 1997, your newly formed UN Foundation joined with Rotary International, UNICEF, the World Health Organization, and the Centers for Disease Control and Prevention in support of the Global Polio Eradication Initiative. How did you learn of Rotary's commitment to the world's children? It was long before I started the UN Foundation. The PolioPlus program must have started 20 years ago, didn't it? And I remember thinking, "Here's Rotary, out there swinging again." It just made me feel real good to know that something was happening, and I had an ongoing interest in the program. Polio can be beaten, just like smallpox. And my favorite international organization besides the UN — Rotary International — was in there taking a lead position in trying to make it happen. Do you foresee any future collaboration between your foundation and Rotary? I would hope that when we get this (polio eradication) done, we could do another project together. I would be proud and enthusiastic to be associated with Rotary in any way. The interview isn't over yet. Seriously, how can we tap the resources of the wealthy to help support humanitarian efforts? Well, you can't make people give — that's not giving. They gotta want to give. It's very complicated, but the best way is to lead by example. Many of us, the majority of us, are influenced by what other people do. When other people that we respect and admire are making substantial contributions, it serves as a good example for those who are considering it. In effect, wasn't that the message you intended to send with the establishment of the Turner Foundation in 1990? Quite frankly, when I made the first major gift of about $250 million to fund the Turner Foundation, my hand shook when I finally signed the papers. To be on the Forbes 400 list [an annual ranking of the 400 richest people in the United States] was a lot of fun. We're a nation that loves lists, and having met a number of very wealthy people, I know that's how many of them define themselves to a large degree. For them, being up near the top of that list is important. I was one of the top 25 richest men in the country. [According to Forbes, Turner ranked 78th on the list in 2003.] Well, if you make a substantial contribution and reduce your net worth accordingly, you're not going to be at the top of the list. I realized that when I signed those papers, I was going to take myself out of the running for one of the richest men in the world. But I decided that I didn't want that list to be one of my priorities. Is too much made of wealth in the United States? At the time, I suggested that some of the magazines should concentrate on who the big givers were because there's another list you could be on and it would encourage giving, whereas the Forbes 400 list encourages holding on to your money. I don't think Forbes, intended that, but that was the unintended consequence of the list that ranked everybody by his or her net worth. Some magazines have published lists of major philanthropists, and I feel that has done some good. Before the economy went down in the past few years, there had been a substantial increase in the amount of giving among the wealthy. Before the UN Foundation, there hadn't been a formal partnership between a private entity and the United Nations. Why didn't it happen before? I guess nobody thought of it. I guess everybody thought the UN was supposed to be run by governments. Quite frankly, the United Nations Foundation was several years into its existence when I came up with the idea for the Nuclear Threat Initiative, because peace and security weren't among the foundation's original goals. I thought peace and security were the responsibility of governments, and we had no business being involved in that. But now I clearly see there is strong reason for nongovernmental organizations (NGOs), as well as governments and international agencies, to be involved in peace and security. Governments are under different pressures than the private sector is. There is room for the private sector in a lot of these areas. How is that? Rotary is an NGO, just like the Turner Foundation and the UN Foundation and the Nuclear Threat Initiative, and we can have a lot of influence on our governments. And we need to, because if government doesn't hear from us, it's going to hear from somebody else. I guarantee you that industry is lobbying the living daylights out of government all the time. I mean, we need Rotary's involvement and that of other civic organizations in more areas, and Rotarians are not going to be sitting back relaxing. Is there a practical way for such groups to partner with each other and with governments? We've done that. We were instrumental in the starting of an organization called the Partnership Project to consolidate environmental groups for lobbying purposes. We got over 25 different groups to work together. We've done the same thing with the National Fish and Wildlife Foundation. We helped fund the start-up of the Theodore Roosevelt Conservation Partnership [an umbrella organization promoting conservation efforts for hunters and anglers], which got their communities more involved with lobbying to save our forests. If we're going to win and preserve the environment so that this planet will still be inhabitable in 50 or 100 years, we're going to have to get into high gear. At the current time, we're clearly losing. We have not reversed the over-fishing of the oceans. We have not reversed the emissions into the atmosphere. Has the United States assumed the necessary leadership role in these areas? Rotarians will understand this because they've always had a strong international focus: The United States is not engaged in the world to the extent that it needs to be as the sole superpower. We're going against so much international protocol. To a degree, we undermined the United Nations by going into Iraq without a clear mandate. We should have gotten another UN Security Council resolution, in my opinion. There are a lot of problems that can only be solved at the international level, and we need a cooperative body to be able discuss things and take action. There are 220 nations, approximately, but only one atmosphere. There is only one set of oceans, and we share it all. We have to take care of it, and the only way to do that is with an international body. What prompted your special interest in Russia and the Cold War? Before I started CNN in 1980, I was not working in journalism, but I realized I was going to be responsible for the editorial policy of this network because I was the primary owner. And so I did some research to see what the major problems were, because I wanted us to identify the problems of the world and then try to attack them. That was CNN's and Turner Broadcasting's main goal: to make the world a better place, as well as to make a lot of money. And that comes right back to Rotary's motto: "He profits most who serves best." I lived by that motto. But back to your question: The number-one problem in the world 20 or 25 years ago, when I started CNN, was the Cold War and the possibility that nuclear weapons, either accidentally or by miscalculation, would be fired. [The films] Dr. Strangelove, On the Beach, Fail Safe — all of those scenarios could occur. So the number-one thing was to end the Cold War. What major problems emerged after the Cold War ended? After that, the second-biggest problem in the world is population. Thirty years ago, the world population was half what it is today. It was three billion. Now it's over six billion. When I was born, it was two billion. So, in 60 years, the world population has tripled. The world isn't any bigger than it was back then. And environmentally, we've gone from having more natural resources than we needed to support humanity to where the environment is now, with current technologies no longer able to run on a sustainable basis to provide for the people who are here. Forests are being cut down faster than they can grow. Oceans are being depleted of fish faster than they can reproduce. The atmosphere is taking in pollutants faster than it can clean itself out. Poison and pollutants are building, and the natural world is shrinking and the human population keeps on growing. So if population is the second-biggest problem, then preserving the environment is the third one. We have to stabilize population, and we have to stabilize the damage done to the environment. We cannot keep degrading the planet. We already have three billion people living in abject poverty. We have half the world living without electricity. We have a billion people who don't have access to clean drinking water. And these are the things Rotary is always concerned about. What specifically needs to change to address these problems? We need a whole paradigm shift. We need to be the best we possibly can be. The way that we've operated in the last several hundred years since the Industrial Revolution isn't going to cut it from here on out. Humanity and the planet are headed for a mankind-induced train wreck. And it's still not too late, in my opinion, to avoid that train wreck. But we have to do things. We have the information. We know about global warming. We know about overpopulation. We have the technological advances to move to a renewable energy economy. We have lots of good reasons to do it. For example? National security is one. Seventy-five percent of all the oil reserves in the world are in the Persian Gulf, a very unstable region. And if we keep buying the oil from there, we'll smother ourselves by polluting the atmosphere with greenhouse gasses, and, secondly, we'll provide the wealth that some governments will use to buy more weapons systems. So the sooner we make the change, the better, and it would stimulate the economy, just like the Internet and the rise of computers did. To make a massive investment in changing to renewable energy from nonrenewable energy — to speed up the day when the fossil-fuel age comes to an end — would be fabulous for our economy. And the moneys that would be spent doing it would be spent here, rather than in the Persian Gulf. Is controlling the proliferation of nuclear weapons your primary concern today? Certainly you need to control the weapons at first. But I'm an abolitionist at heart, and a strong believer in nuclear disarmament. There are always arguments that we should keep some of them. But that's still enough to destroy the world. And if the United States keeps, say, 2,500 weapons, then the Russians are going to keep 2,500. Your NTI calls for a 10 percent reduction of nuclear arms every year for 10 years. Do you think your plan is achievable? Absolutely. Because it's a real simple plan where you would have to have verification. We have the IAEA (the UN's Inter-national Atomic Energy Agency) and they could staff up and do it. But you have to have people who want to do it, people who think the world would be safer without nuclear weapons, which clearly it would be. Let's talk about that plan. How would it be enacted? What would it take to get the plan off the ground?All it would take is for the member nations at the United Nations to vote to implement it, and then everybody would get working on it. It certainly would be doable to remove 10 percent. It would be a big project to destroy 10 percent of existing nuclear arsenals every year, but it would be verifiable. It would be over a 10- year period. Theoretically, anybody could pull out of it if they really wanted to. You would have to have unanimity. But there are only eight nations that we know of that have nuclear weapons and about 40 that could have nuclear weapons in a relatively short period of time if they wanted to. You have a vast majority of the world — 90 percent of the countries — that don't want nuclear weapons. That's a pretty heavy majority. Your knowledge of world leaders and world affairs these days is very broad. When you were younger, who were your heroes? I have busts on my desk of my two big heroes: Mahatma Gandhi and Martin Luther King. My heroes went from being Alexander the Great and Horatio Nelson to King and Gandhi. Gandhi got the British to leave India peacefully, a giant undertaking. And King and the civil rights movement successfully achieved many of their goals with a minimum of bloodshed. It really disturbs me that after all of the thousands of years it took for Gandhi and King to come on the scene and perfect the doctrine of nonviolent opposition, we still have war in the world. But isn't it true that your early hero, Alexander the Great, was one of the first important internationalists? Yes, that's true. In the past, military conquest had its place, but that time has gone. Before the Industrial Revolution, less than 10 percent of war casualties were civilians. Now, it's more than 90 percent. And since the Industrial Revolution, we depend on the infrastructure of roads, bridges, schools, and hospitals. You can blow them all up in one day, but it takes a long time to rebuild them. You once said, "You gotta believe, like Martin Luther King, in the ultimate morality of the universe." Given the many problems in the world these days, are you still a believer? There's no question that we have to believe. If you don't think that change is possible, that it's possible for us to make a significant change in the way we're doing things in our relations with one another and the environment, there's not much hope for us. But if we do, then it's in our hands. It's a free choice. Our problems are still solvable. They have not gotten out of hand yet. But the longer it takes for remedial action, the further we slip behind the eight ball and the harder it is to do. Look at the global warming that we have: It would take years to reverse that, even if we started right now. The important thing is you've got to educate everybody. There are billions of people in the world today who are still illiterate. Should religious leaders become more involved in these major issues? Well, it was my idea to get the world religious leaders together at the United Nations two years ago. They unanimously decided to ask their followers to not start any more wars in the name of religion. I spoke to them and got a standing ovation. I mean, it was everybody — Muslims and Hindus and faiths from all over the world. The pope had one of his top representatives there. It was incredible. What about your own spirituality? How important is it to you? I'm kind of agnostic. I don't know what's out there. I'm not doing what I do because of religious beliefs. I'm doing it because I think it's the right thing to do. The way I've interpreted religions, it seems to me that no matter how you see God, he wants us to be nice to each other. Virtually every religion that I've ever studied has "Thou shall not kill" as one of its tenets, yet killing goes on. So in many instances, people aren't practicing their religious beliefs. If we had more people living the way they ought to live, then we'd have less violence in the world. And much more sensitivity to the way we live on this planet, and the way we treat each other.